Want to hear something totally crazy? You can earn a college degree… IN HIGH SCHOOL. What! Yes. How is this a thing? It’s called Dual Enrollment, and it’s an awesome way for your child (and you) to save time, money, and get a head start on their college career… before graduating High School! I talked to Erin Hintze, a High School senior at Xavier College Preparatory in Phoenix, Arizona who will be graduating with her High School diploma this May… along with an Associates of the Arts COLLEGE degree. #1: So what exactly is Dual Enrollment? Dual Enrollment, Concurrent Classes, Special Admissions… Whatever name they’re given, they’re Dual Credit courses offered by a student’s High School and partnering college that count toward both the student’s High School Diploma and their college credits. (Hence the “Dual”) Basically, your student is taking two classes in one. #2: What are the requirements for Dual Enrollment? Requirements for Dual Enrollment vary from state to state. But I dug up this nifty document that can give you specifics on any state in the US. #3: Where do you take Dual Credit Courses? Where are my keys? Where is the remote? WHERE IS WALDO? We may never know these things. The location for your Dual Credit courses, however, can vary. The state ultimately determines what is allowed. If you’re interested in earning a degree in High School, you’ll learn in a bit about how you can take additional online classes along with your dual credit courses. #4: Why should my student enroll in dual credit courses? Isn’t Dual Enrollment just another reason for schools to ask for money? Actually, if your student takes Dual Credit courses, it will SAVE you money. Think about it — You are paying for your student to take essentially the SAME class in both High School and College. Let’s say that you’re going to earn yourself an Associate’s Degree through your Dual Enrollment. According to topuniversities.com, a standard Associate’s Degree in the U.S. requires 60 credit hours total. That’s exactly half the credits of a Bachelor’s Degree, the typical 4-year college degree requiring 120 credits. OK, but wouldn’t it be better if my student just waits until college to earn those credits? OR, you could save the time your student would spend re-taking that class in College that they already took in High School, and make room for them to add classes that are specific to their major. Especially since the majority of students will change their major at least once throughout their High School career, normally setting them back a year or more. Still not convinced? Check out the responses I got from my interview with Erin. #5: What’s this about earning a degree? We sat down with Erin and her parents, Denise and Patrick, to talk about how this was possible. In case you didn’t catch it before, Erin is currently a Senior in High School. 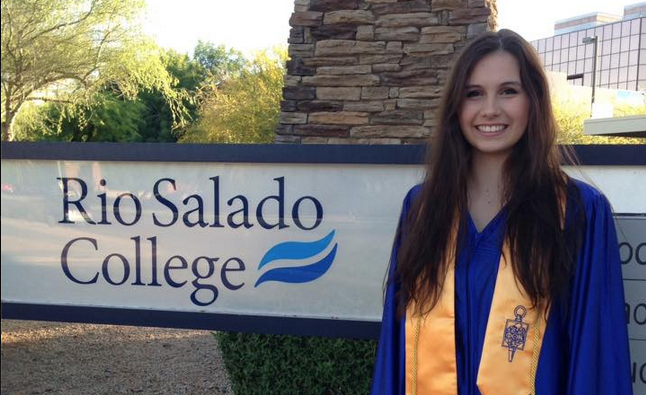 On May 5th, 2015, she’ll receive her Associates of the Arts degree from Rio Salado College, making her a college graduate before she’s even graduated High School. Q1: How did you hear about Dual Enrollment? Erin’s parents first heard about Dual Enrollment from Erin’s older cousin Stacey. Back then, Patrick says, the school was only offering “a little over 12 to 15 credit hours.” However, Xavier in particular has increased the amount of dual credit hours yearly. Q2: How was the process overall? Erin and her mom explained that originally, the principal of her High School arranged a meeting for all the students that could qualify for earning the degree. 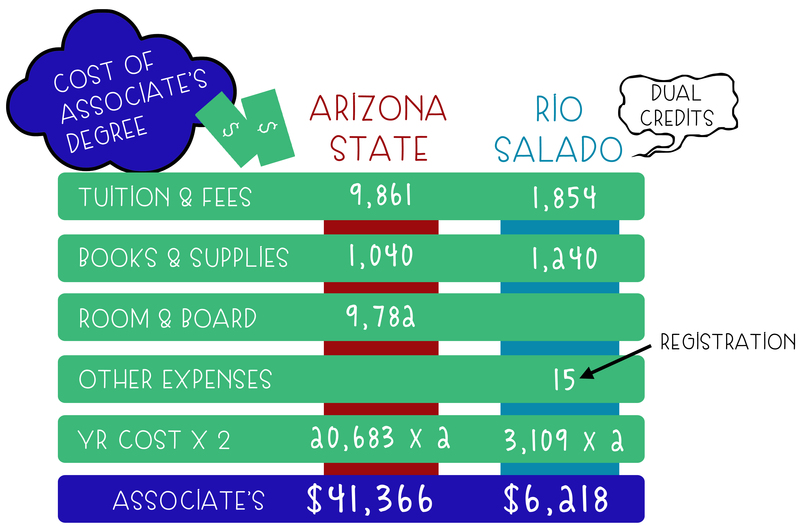 At the meeting, Xavier gave the students access to the email of a Rio Salado counselor, and the students were encouraged to get in contact if they were interested. Q3: Were there any challenges in earning your degree? Erin is a working student. For her degree, she took 2 additional online classes outside of her dual credit courses. Her parents and her explained that the biggest challenge of all was Time Management. Erin is also a great example of what being organized can mean for a student’s academic success. Q4: Were your dual credit courses more difficult than your regular classes? Erin also opted to take her CIS class over the summer so that she could receive dual credit for it. Courses that don’t meet the Dual Enrollment curriculum can be modified to count as college credits. She explained that time management came into more play then than it did during the school year, because summer was accompanied by extra hours at her job and time with friends. Q5: How does it feel to have earned a College degree before graduating High School? Q6: Did taking Dual Credits help you decide what major you wanted? Q7: As parents, what was the majority of your involvement in the process? Q8: You said that other parents and kids have expressed regrets to you about not doing the same thing, what is some of what you’ve heard? Q9: What would you recommend to students and parents considering Dual Enrollment? What does Erin have to say about it? Q10: Will Lauren be enrolling in Dual Credit courses? Lauren, Erin’s younger sister, is currently a Freshman at Xavier College Preparatory. #5: Are there any downsides to Dual Enrollment? What Erin’s father had to say about Dual Enrollment being for the serious student is pretty accurate. If your student is struggling in their regular High School classes, they’re probably not ready to take on college level coursework. If your student does poorly in a dual credit course, some schools may be able to see that grade on your application. For example, if you are applying to Med school. If your student is taking Dual Credit courses to “artificially inflate their GPA” as Patrick puts it, they may be placed into higher level college classes after graduating that they can’t handle. #6: What colleges accept Dual Credits? OK, so I’ll admit, not everybody is on the Dual Credit wagon just yet. By “not everybody”, I mean the Ivy Leagues. But there are plenty of Public Universities who will accept your Dual Credits! 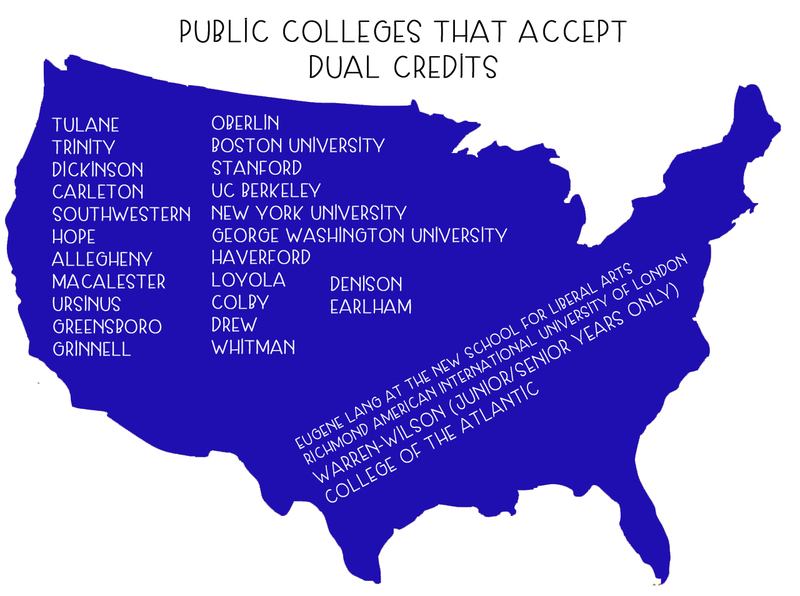 Here is a list I found on College Confidential of some public colleges that accept Dual Credits. 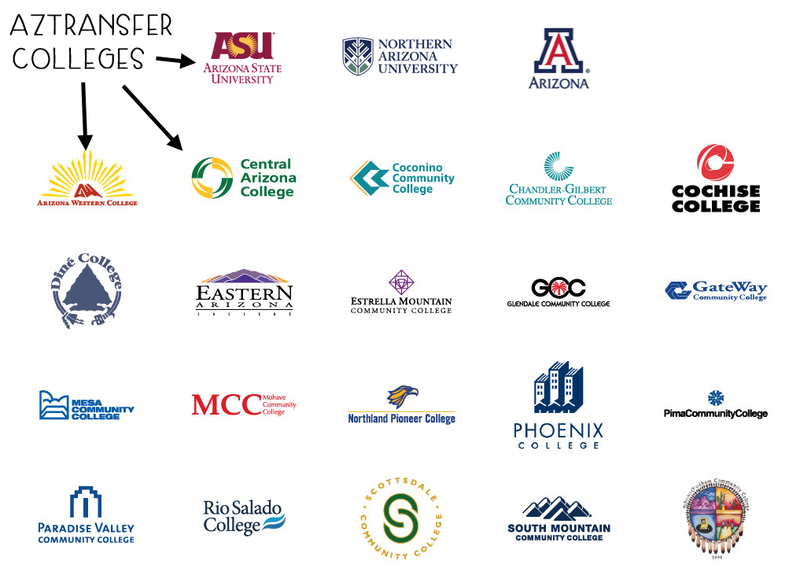 Also, if you live in Arizona, you can take advantage of AZTransfer, which is a collaboration between several Arizona colleges to provide Dual Enrollment options for students. #7: How do we get started? It all starts with your High School counselor. Schedule an appointment with them to talk about your school’s options for Dual Enrollment! Dual Credit courses can offer your student the chance to get ahead in their college career and possibly even earn an Associate’s Degree before graduating High School. Erin’s experience with Dual Enrollment has left her feeling prepared and ambitious for college, and she is even considering a triple major! Dual Enrollment means you’re taking Dual Credit courses offered by a student’s High School and partnering college that count toward BOTH the student’s High School Diploma and their college credits. Dual Credit courses are typically offered on High School campuses, college campuses, and sometimes at another location that has been approved for the course. Know anyone who has benefited from taking Dual Credit courses? Tell us in the comments below! I started college at 14 years old (freshman year) with the help of dual enrollment. As a result, I will be graduating high school and college at 16. I love how you are informing others about this opportunity. Check out my blog, ayounglegend.com, which documents my experiences as I receive a diploma and Associate of Science degree in the middle of my junior year. Subscribe if you like what you see! What is the earliest you can start? As early as you like! I can’t believe this! I wish I had known it was possibly to get an Associates degree in high school! That would have been very valuable to me. Even just an Associates degree does a lot for your resume and can be crucial in getting a good job. Thanks for commenting Jasper – I agree! It’s crazy what opportunities are out there for students from a very early age these days. Something to definitely take advantage of. I am sorry I do not know all of them off the top of my head. Schools are changing all the time. Each school is different. I would suggest contacting the schools that you have questions about to check! All 50 US States currently have dual credit options. Many of them vary in their extent, some not allowing students enrolled to earn an associate’s degree, some only allowing juniors and seniors to take them, etc., but every state has one. Whether or not your high school will be required to (or will choose to) take advantage of it is usually either up to state policy and/or the high school’s discretion. However, I believe you can still participate even if your high school doesn’t exactly publicize the opportunity. I just graduated from a Medical High school with 45 college hours and I am so thankful to have taken dual credit. Now as i enroll in college courses for the Fall at a state university I love the feeling of being so ahead. I will be receiving my associates degree in December of this year! It is so awesome that this is offered in high school.